Baked Potato Corn Chowder is easy, versatile, and comes with a heavy dose of vegetables. So I know it’s kind of uncommon, but baking a soup in the oven is a little quicker than a slow cooker but slower than the stovetop. It’s a nice middle when you have forgotten to get your slow cooker rolling at lunch time, the kid are almost home from school, and your evening is looking busy. That being said, this recipe translates well to the stovetop or the slow cooker. 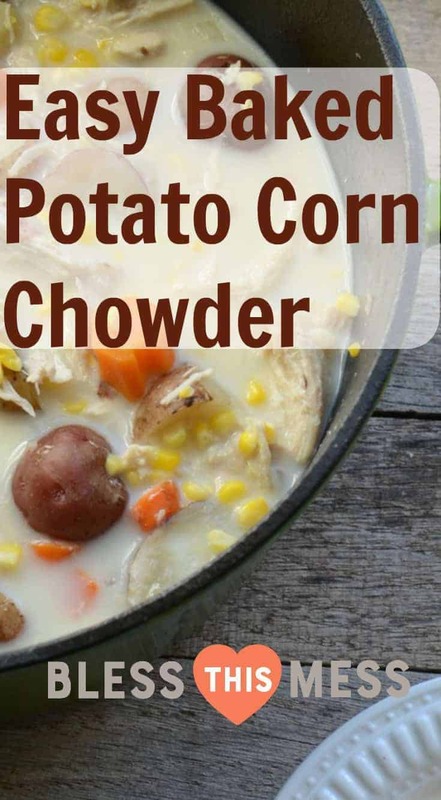 This is my go-to potato corn chowder recipe and I make it often! I’ll tell you all my tips and tricks in the notes of the recipe. I love this recipe because I generally have everything on hand, it’s warm and comforting, and it’s pretty healthy, thanks to a heavy hand of vegetables. 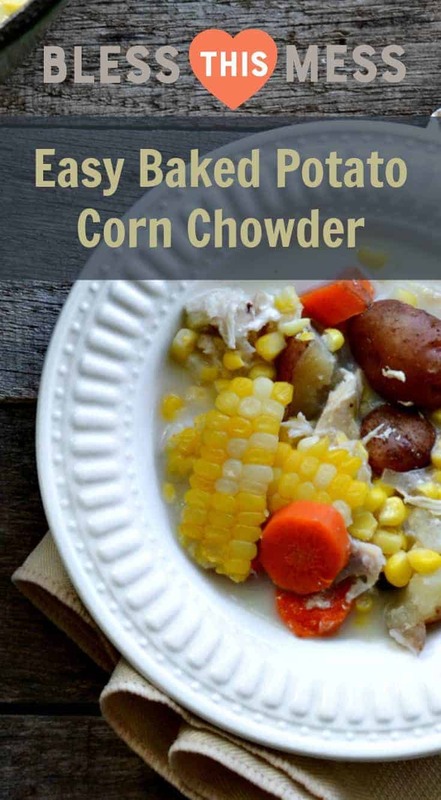 Just add a little cream at the end of cooking to make it extra delicious and serve this soup with a side of cornbread or corn muffins and some fruit. It’s kind of a meal in a bowl, which I love. While Thomas often adds more sour cream to his bowl, I like to add hot sauce to mine. The kids eat it up just like this. 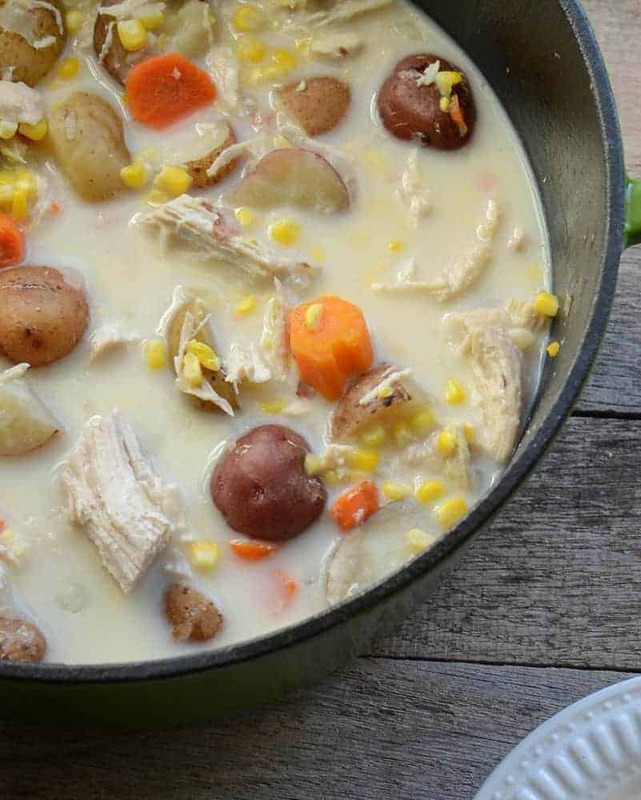 I love to bake this soup in my cast iron Dutch oven. Cast iron is great to use in the oven because it distributes heat well and the lids generally fit firmly (because they are heavy), trapping moisture and heat inside. Cast iron Dutch ovens with lids are wonderful for making a quicker version of my favorite slow-cooker recipes (like these chicken legs). They are great fix-it-and-forget-it meals for busy weeknights when you didn’t remember to turn the slow cooker on. This recipe is so forgiving! If you don’t have chicken, throw in some cubed ham, cooked ground sausage, or even sliced smoked sausage. You can cook this in the slow cooker by adding everything except for the cream and cooking it on low for 6-8 hours or high for 4-5 hours. Shred the chicken at the end of the cooking time and then stir in the cream and additional seasoning before serving. To make it on the stovetop, cook your onion, carrots, and chicken (chopped up) in a little bit of olive oil. Then add the other ingredients (except the cream). Allow the soup to simmer until the potatoes are tender, about 30 minutes. Add the cream and adjust the seasonings to taste just before serving. 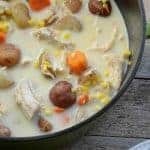 How do you thicken soup after it is made? Add a few tablespoons of flour or cornstarch to act as a thickening agent. Be sure to whisk properly to avoid clumps. What do I serve with soup? 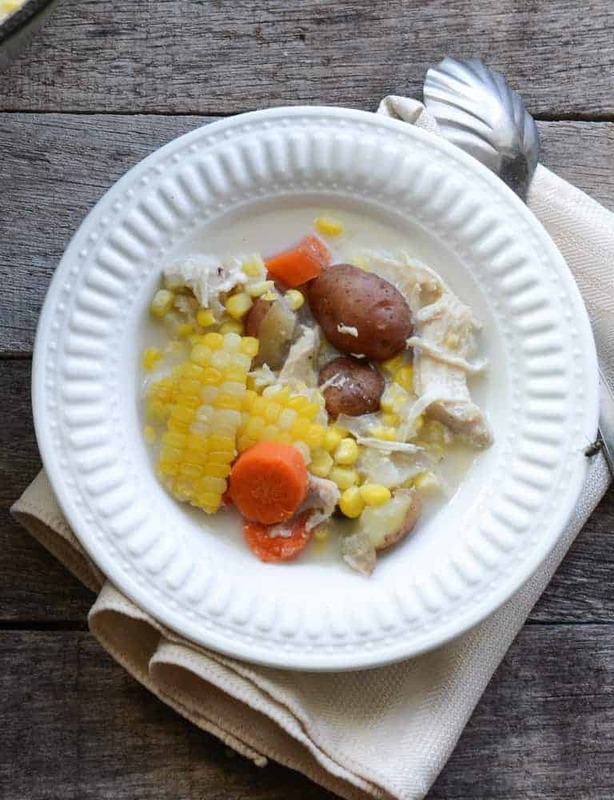 This Baked Potato Corn Chowder is easy, versatile, and comes with a heavy dose of vegetables. Preheat oven to 325 degrees. 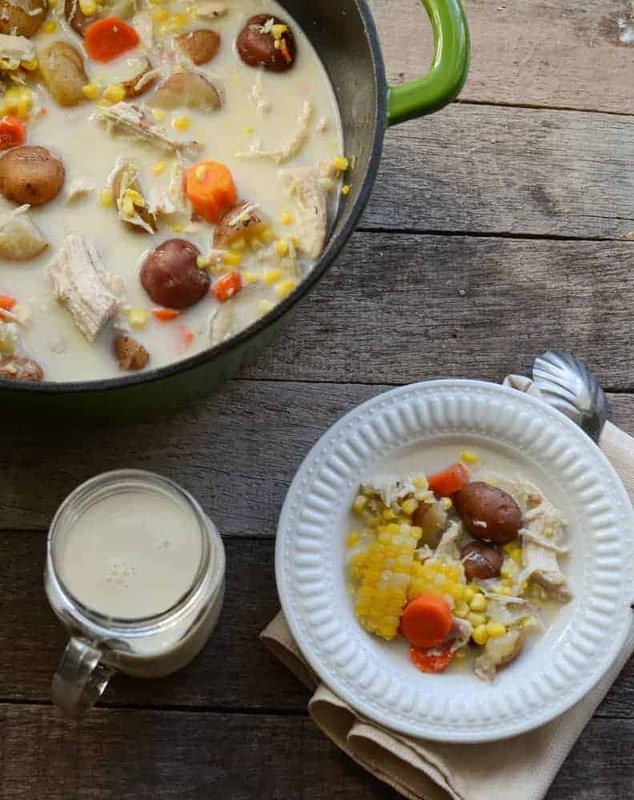 In large cast iron Dutch oven with a lid, add onions, carrots, potatoes, corn, chicken, broth, salt, pepper, and garlic powder and stir to combine. Place the lid on the Dutch oven. Place in the oven and bake for 1 hour and 30 minutes to 2 hours, or until chicken is cooked through and the potatoes are tender. Remove from oven and shred the chicken into bite-sized pieces. Stir in cream and more salt and pepper to taste. Serve hot with fresh cornbread. To make it on the stove top, cook your onion, carrots, and chicken (chopped up) in a little bit of olive oil. Then add the other ingredients (except the cream). Allow the soup to simmer until the potatoes are tender, about 30 minutes. Add the cream and adjust the seasonings to taste just before serving. You are going to make this recipe over and over again! Enjoy, from my home to yours! This looks so good! I have everything on had except for cream. Could I use sour cream instead, or will it effect the taste too much? Thanks! Yes, and some times I even use cream cheese or evaporated milk, all of them work great!